This video is a simple updo for Senegalese twists. All you need to complete this style are bobby pins. 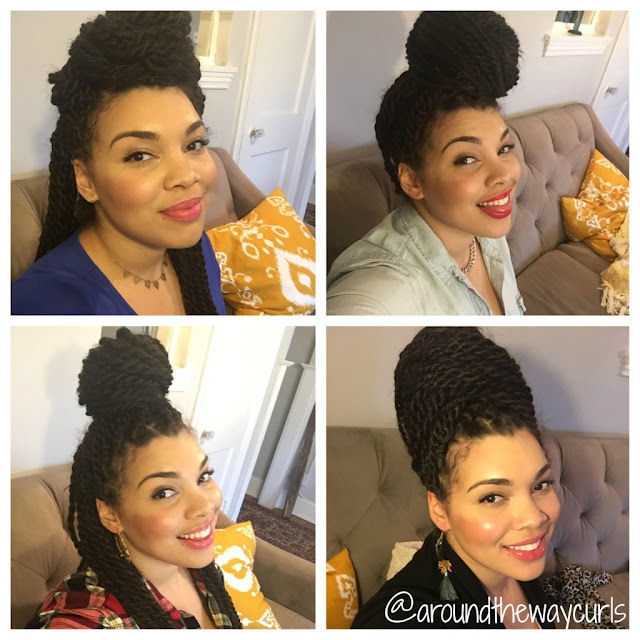 Keep in mind you want to hydrate your real hair while they are in the twists. The easiest way to do that is to create a hydrating mist and spray your hair both at night and in the morning. If you follow us on Instagram you’ll know that while I loved my twists, they unfortunately, were not for me. My hair was far too thin and fine for them. I left the twists in for about a month and after, I did I experience a lot of breakage due to the weight of the hair and the amount of updos I wore for work. They didn’t feel too tight but at times, they felt too heavy. There was just too much pulling at my roots. Oddly enough however, the hair that was not being ripped from my scalp was pretty happy and healthy. LOL. This told me that the moisturizing mist worked but the weight of the twists did not. So, I still recommend them as a protective style just not for women with fine or damaged hair. You must have that real good healthy stuff to rock these. Oh well, you can’t win them all. I tried and my hard headed/big headed self will probably try again and complain about being bald when I take them out. Whateva. At the end of the day it’s just hair. Right? Have you tried Senegalese twists? What was your experience?